From the original Star Wars movie on Tatooine. 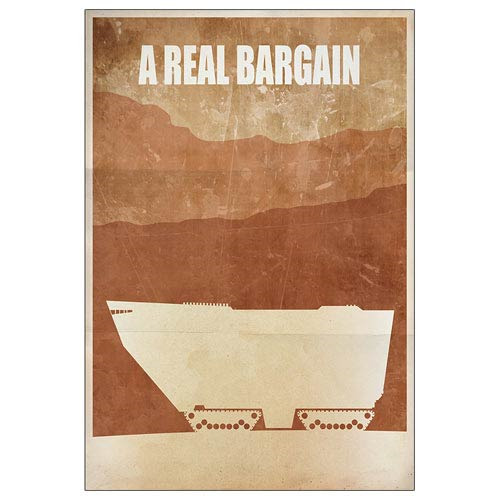 Everything you can purchase at a Jawa Sandcrawler sale comes at a real bargain! That is, you get what you pay for. This Star Wars Jawa Sandcrawler A Real Bargain Paper Giclee Print will remind you to always be careful about what you're buying and who you're it buying from. A droid may look perfectly fine and operational on the outside, but it could simply break and malfunction the moment you start haggling with the Jawas. Or, you could take a couple of functional little droids home, expecting them to work out fine, and then later come to find that not only do they have a tendency to run off on pre-assigned missions once you take off their restraining bolt, but that they are also in fact being pursued by the unforgiving Galactic Empire who will totally kill you to get the droids back! No, no, as wonderfully inexpensive as a Jawa Sandcrawler makes buy droids, it's best to go the safe route and just purchase some droids at your nearest shop - at least that way you know the droid's origins and may also be able to get a warranty if it malfunctions. This great giclee has been printed on paper, is a limited edition of 125 pieces, features a Jawa Sandcrawler on the silhouette background image of the Tatoone dunes and mountain ranges and has the words, "A real bargain." Ages 16 and up.